I’m drawing ten thousand flowers on index cards and giving them away to people. Because I derive enjoyment from senseless acts of beauty. 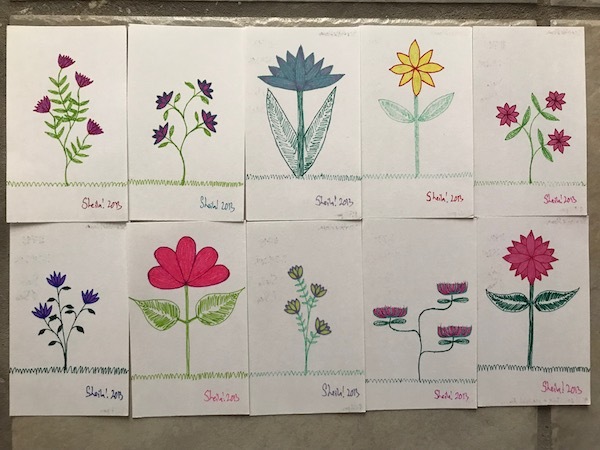 When I got it in my head that I was going to draw flowers on index cards and give them away, I decided I needed a specific number to shoot for so it would be a quantifiable goal instead of a vague aspiration. It’s also extremely likely I was hypomanic at the time, since I was cranking out ten flowers a day when I was starting out, and figured I’d be done inside of three years. (I’m down to two flowers a day, so we’re looking at a decade or so now.) I can’t rely on hypomania to enhance my productivity, especially now that I’m on mood stabilizers, but I’m determined to see it through. The Google tells me that there’s a 13th century poem that refers to ‘ten thousand flowers’ by a Buddhist monk known as Wumen Huikai but I wasn’t aware of it until after I’d embarked on the project. I want a flower! How can I get one? If you’re dialing in from outside the United States, enclose an International Reply Coupon with your self-addressed envelope. Can I PayPal you money for postage instead? Sorta. I’ve set up a Ko-Fi at Ko-Fi.com/wonderbink so you can drop three bucks (the price of a no-frills cup of coffee) on me via the wonders of PayPal. Once you do, send me an e-mail at 10kflowers-at-wonderbink-dot-com giving me the name you donated under and your mailing address. I’ll get it out in a jiffy. Any money left over goes to the Ten Thousand Flower Fund, to pay for pens, index cards, labels, and other flower-oriented expenses. Do you ever hand them out in person? I’ll sometimes pop up at art events and such (mostly in the Atlanta area) and offer them to anyone interested. Keep an eye on my Twitter feed (@wonderbink) and on the hashtag #10KFlowers if you want to know where and when.